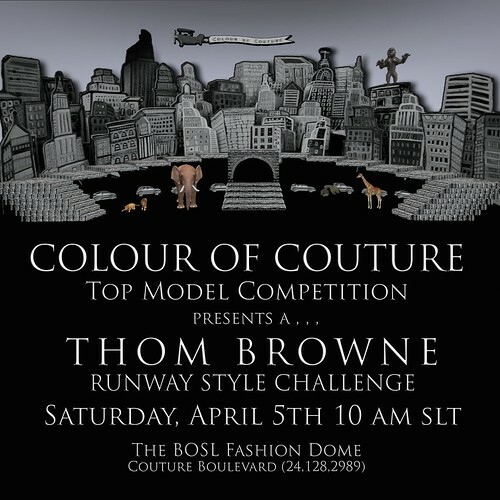 This the second in a series of runway challenges which test the mix and match styling capabilities of our contestants to bring their unique skills to be measured based upon a theme from the fashion world outside of Second Life. When Thom Browne came up with this Elizabethan Theme “Clown” he proclaimed to have never seen a clown, he imagined what one would actually looked like on the runway and used his insane way of thinking to bring the clowns to life. Hundreds of millions of people, businesses and governments around the world unite each year to support the largest environmental event in history – Earth Hour. More than 7,000 cities and towns in 152 countries and territories switched off their lights for Earth Hour 2012, sending a powerful message for action to save the planet. This year, more than 200,000 individuals accepting I Will If You Will challenges on YouTube to turn their symbolic action for the planet into an ongoing commitment to a sustainable future. Earth Hour is organised by the World Wildlife Fund (WWF). With almost 5 million supporters and a global network in over 100 countries/territories, it’s one of the world’s largest and most respected independent conservation organisations. WWF’s mission is to stop the degradation of the Earth’s natural environment and build a future where people live in harmony with nature. The challenge for the Earth Hour/Cosmos Couture was enlightening, interesting and fun, and for this challenge, I used nature and textures. My inspiration for this challenge consisted of the rare if hardly seen blue leaves of the hosta plant, the blue gum trees, blue ash and Colorado blue spruce trees. In western N. Carolina, there are blue ghost fireflies to add to the mix, not to mention the iridescent blue ground beetle for the added flair on the peplum. The skirt is a beautiful rain forest waterfall texture borrowed from wallpaper, the blue & green colors represent the earth and my inspiration was the rain forest, which represents the lungs of the earth-one of mother natures greatest gifts to mankind. The earrings represent the coral of the sea, which provide home for 25% of all marine species. These rare things represent the damage that we have done to our planet, because in the rain forest and other beautiful parts of the world, there is a devastating impact of climate change, and other environments worldwide that only we can fix if we all want to take the time to do so, which part of this is what the Earth Hour means. The Cosmos Couture challenge consists of design elements such as forms, color, textures, scales that come into play when one designs a wearable item. Its a great opportunity to explore these new resources and materials used in the natural environment and to find ways to apply them to Haute Couture fashion and creating a bridge between fashion, nature and architecture‎. Earth Hour is an annual event meant to raise awareness about climate change and the environment. This encourages individuals and organizations around the world to turn off all of their non essential lights for one hour. It was my personal pleasure to add all these elements together in order to create this outfit, I hope you enjoy it as much as I do. Shoulder Accents, Skirt & Train from “Pine Dress” by Vita’s Boudoir. If we each make small changes we give a chance for Nature to breathe and begin to recover. 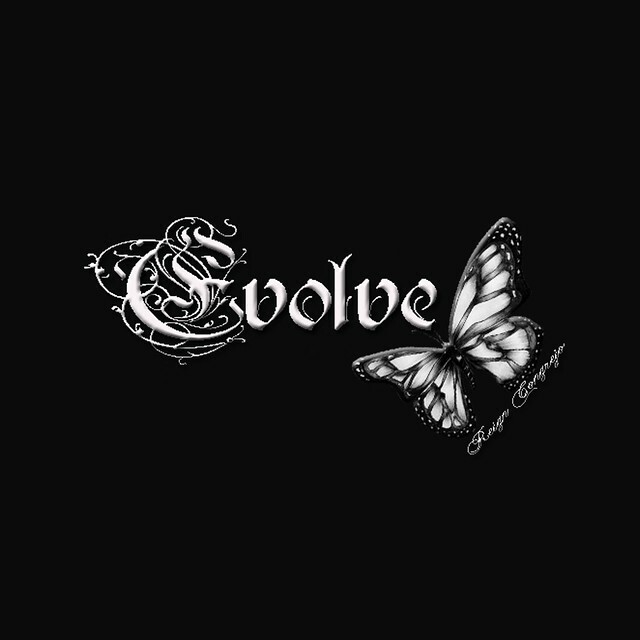 I wanted to show Nature and the Earth symbolised in the butterflies, flying free and multiplying, beginning to cover the black ironwork. For me they are a symbol of delicate hope, fighting back against the impact of man’s industy, given the chance because of all our efforts to make changes in our impact on our Planet. With this styling I tried to blend organic elements of the Earth with both cosmic and spiritual elements. I wanted my outfit to reflect the fantastic mysteries of the Universe and where we Earthlings fit into the grand scheme of things. 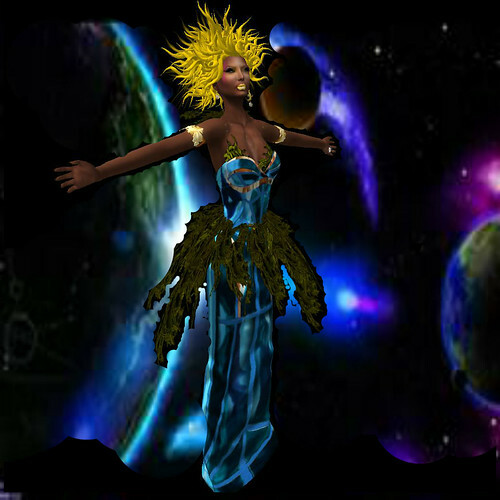 I styled myself as a mystical goddess, balancing the Earth effortlessly on my crown as I dance through the galaxy. We see this dance of the Goddess in all things, cycles, and seasons, and the more in tune we are to these cosmic patterns, the better off our planet and all of its inhabitants will be. My inspiration for this outfit different patterns and shapes.Using some basic high tech lights and glow i was able to create this outfit.Kept it subtle elegant but also cyber and cosmo style.As it is Earth Day so the color green and blue is all over my outfit. Hello ladies and gentlemen my name is Frayar Resident and I hail from the good ole USA. The land where diversity thrives in it’s different people, music and styles. My Earth Hour Style was inspired by the ethereal look of the earth from the stars. My gown represents the various shades of blues, whites and browns carved through the earth bringing with it life. The green leafs are the green you see and represents the trees. My hair is the yellow of the sun, the warming balanced needed to sustain all life. It hangs between the moon and the stars as shown with my earrings. I believe the most important part of the earth’s care is us, with the intelligence to understand it’s flow and the ability to harness it naturally for all life. I hope you enjoyed my styling, but hope most of all you love this earth to life. 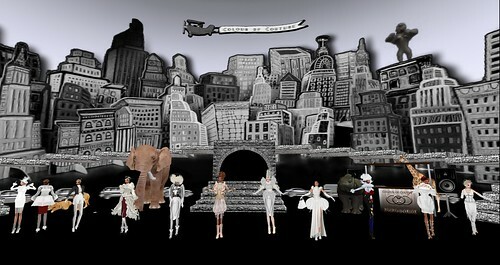 The challenge is to represent the relationship between the built environment and the Earth through second life fashion. To do so I have chosen to represent Kestrel as Yemaja, the Yoruba spirit guardian of the oceans and protector of the Earth’s children. Kestrel, wearing Finesmith’s Diali dress in Circulate, is draped in the colors if the earth and sea. She wears Finesmith’s Dola tiara in silver and blue gemstone the colors of Yemaja. These colors are also seen in her makeup: Madrid Solo’s Melancholy lipstick and eye shadow. I chose Finesmith’s Shape of My Heart wings for this styling to represent modern steel structures, technological masterpieces of the built environment. Some might consider the Earth and the built environment to be antithetical, but in my styling, Yemaja is not burdened by the weight of the steel. They wings lift her and give her strength from the good technology has to offer to heal the Earth and make it a better place for all. So many people abuse Earth. Wanting a way to inspire individuals to preserve our planet, Sarah decided that the best way to do this was to go back to a basic rule that is used when trying to change peoples mindsets: Become a role model. When Sarah is passionate about something, she comes up with the idea that can’t be ignored. So for this endeavor, she choose to make a outfit that looks like a budding flower. 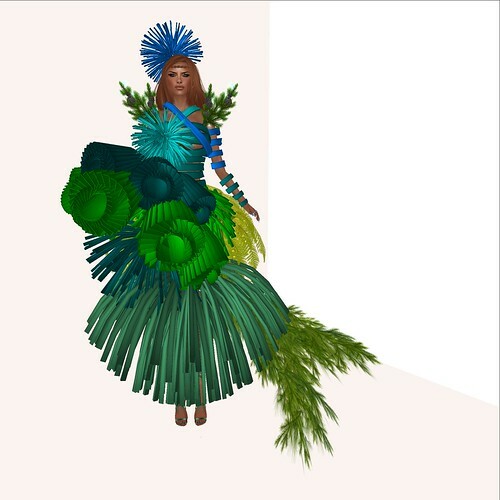 But the best part of this outfit, is this it’s made with recyclable fabric and bamboo for the 3d flowers on it. Of course her makeup and accessories are all eco friendly. I thought the symbol of the earth where we live is “water”. So I tried to express water that circulates the earth. No creature with life can survive without water. and it will eventually merge with a bigger stream and will then vaporize only to return to another petal. I appreciate that we are given lives in this cycle of water, irrespective of whether we are organic or inorganic. My styling was inspired by the industrial/interior design component that is the hallmark of cosmo couture. I employed the Earth Hour colors of green and blue as often as possible, but I included some other colors as well to serve as representations of the variety of colors present in our world. My accent pieces are bits of a crashed satellite, which I found fitting in that satellites orbit Earth to monitor it and study it in a variety of ways. When Tivi thinks about the Earth, she tries to think positive. There are so many negative things on the planet right now, and many negative things happening to it… but instead, she tries to focus on the positive… the life that is still thriving within our still-beautiful planet. It was then that she set out to try and create a ‘living garden/rainforest’ idea in a dress. With her unashamed obsession with shows like Project Runway, she considered the ‘cosmo couture’ element of this challenge to be a bit like an “unconventional materials challenge’ and so the base mesh dress and gloves she chose were perfect, looking almost like re-purposed, re-structured plastic, and just enough of an oddity to make you tip your head and look twice. The birds and butterflies flying free on the tails of the skirt train, as well as the flowers resting on the gown were meant to symbolize a bit of ‘home’, the Hawaiian Islands, where her father’s side of the family grew up. Hawaii, and its other islands, are a constant reminder to Tivi that no matter how ugly the world can seem in the metropolitan city-scapes wracked with pollution, there is still beauty somewhere, in the quiet serenity of a peaceful island. Vera based her styling on the beauty that encompasses the basic home interior items, and decorations. Her head and neck-piece are designed using different cuts of mirror that once dawned the walls of a luxurious home. Her gown is compiled of a colorful variety of window coverings, draping her lightly colored legs. She has fashioned a beautiful flowing skirt out of leaves from a plant that was meant for an interior walkway. The soft blossoms add color to her her mirrored crown. 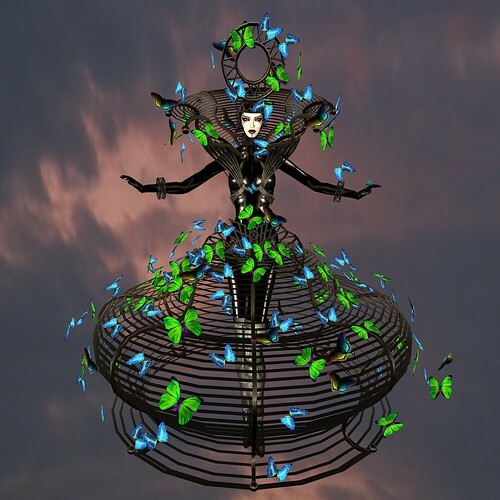 She has decided to allow the butterflies to inspect this fabulous faux flower creation, delicately accented with a touch of color from her favorite make up artists in Second Life. 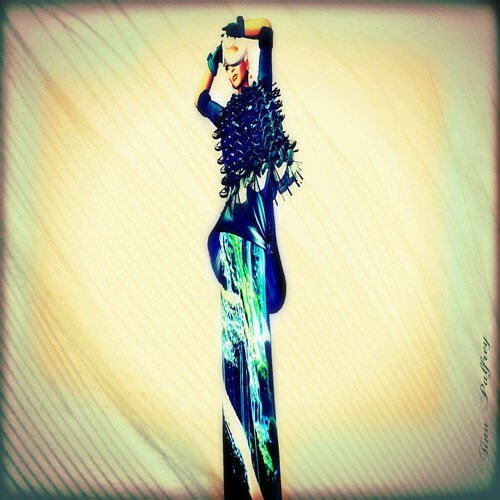 Her amazing design was created using the designs from Alyce, Damned, Desir, Finesmith, Loovus Dzevavor, Madrid Solo, Mea Culpa, Mes Petites Coutures, Moondance, Nuuna, Gizza, and Vita’s Boudoir. Earth Hour inspired my Cosmo Couture so I wanted my colors to be representative of the earth’s yellow sun, green grass and blue oceans , skirt made out of painted wood paneling and old newspapers my dress bodice made from Styrofoam packing my collar made from metal screws. My lives, First and Second, has been quite an adventure so far, to say the least. They both bring the unexpected and are constant reminders that I, even at my age, don’t know everything. Earth Hour, is one. Until Colour of Couture presented this challenge to us, I had never heard of this worldwide event where millions switch off unessential lights for one hour raising awareness for the planet. Merging both my lives, I’m styled with the things I will surround myself with during my first Earth Hour with me being the centerpiece — the one who brings and *keeps* everything together. Thank you once again, Colour of Couture, for bringing something new to my lives. 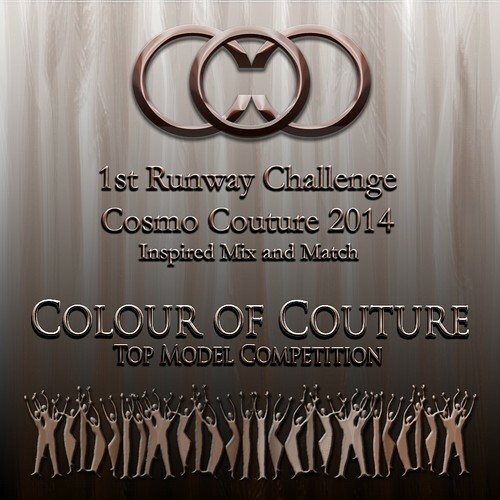 Why have you entered Colour of Couture – Top Model Competition? have always held a great love for the various cultures of both worlds in which we all walk. Each is so significantly beautiful and unique with so many wonders to be explored. This competition signifies to me, a representation of exactly that, a celebration of the beauty of our world in all of it’s glorious forms and an opportunity to explore and represent each in turn. I think it is a fun and fantastic opportunity to stand up and show the world what it is that I see in each of these fantastic cultures. 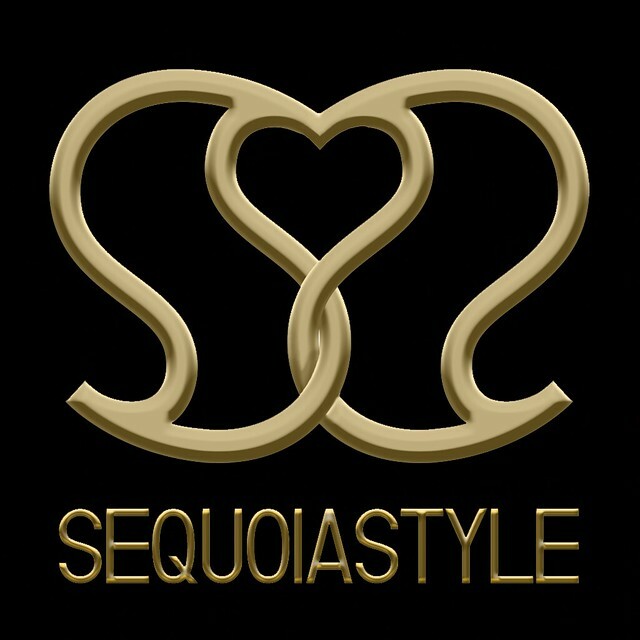 What particular qualities, personality & style should Miss Colour of Couture posess? I believe that Miss Colour Of Couture has to truly love her role and duties, first and foremost. Realistically, to carry this title and it’s duties for a year, this will be the first key to success for everyone within the organization. She must be a team player and have a realistic idea of exactly what that means, ready to listen to members of the organization with an open heart and mind to work towards common goals and represent the organization in the best possible manner. She should be a diva, in that her beauty should shine from within for all to see, her outward appearance should be a mere reflection of what they will find within her. She will be a role model for women of culture and colour and must be kind, compassionate, outgoing. She must not only be willing to be seen and to reach out to them, but unafraid to extend her hand in welcoming them to join her. She must lift them, in a sense. She must see beyond colour, beyond culture without ever losing her identity. She must represent them all, with great love for who and what they are. I suppose in many ways, I am describing somewhat of an angel but I believe this role really is one of great importance and the woman chosen must be and should be incredibly special in a multitude of ways. She will be the first in this title, she will set the bar in a manner of speaking and that cannot be taken lightly. Miss Colour Of Couture should do this naturally and effortlessly. 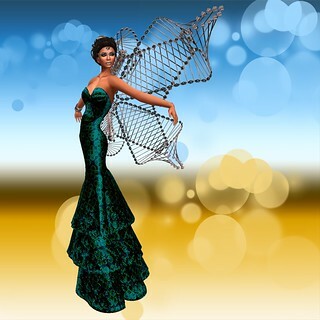 What are your thoughts and feelings about fashion in Second Life? 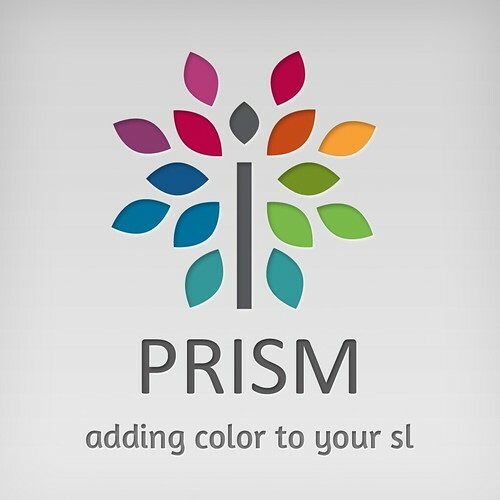 What is your role as a Woman of Colour in SL Fashion? 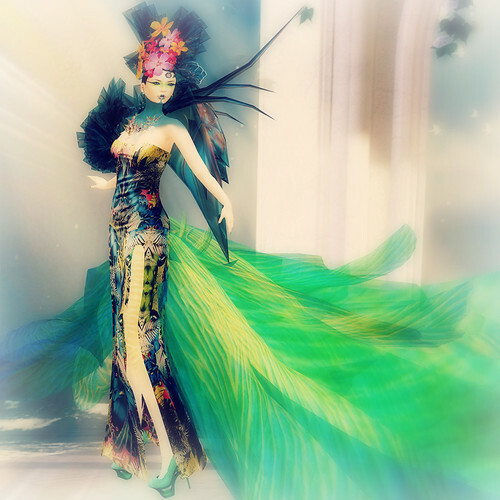 Fashion in Second Life is absolutely incredible, the possibilities are limitless, endless and it’s simply a cornucopia of wonders! There is always yet another fantastic designer to find and fashion as a whole is truly about so much more than simply looking great. 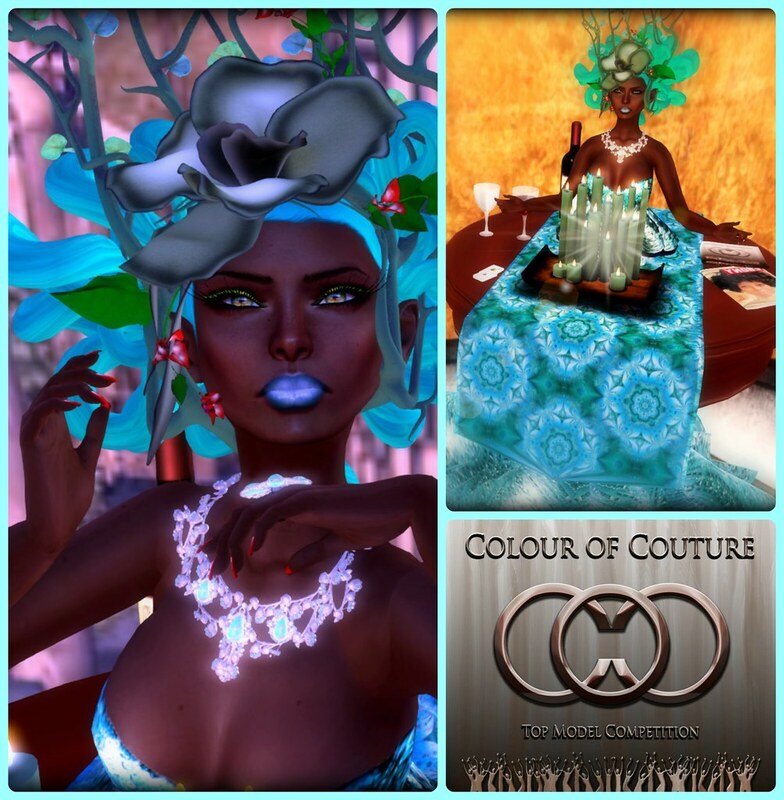 My role as a woman of colour in fashion within Second Life is the same as any other woman in this industry. I do not see my colour, I see beauty in each and every woman I stand beside, whether model or not. I think that in many ways, how we look will define what we see. If we see a difference, then there will be a difference. Most things in both worlds are self inflicted. My role is that of a model and designer. My role in fashion is one of representation. I represent the experience of those who have taught me, of the schools who will certify me, of the designers who have toiled lovingly over whatever I am wearing at the time. I represent that which I love, the flavours of a thousand nations;colours and histories locked into fabrics and patterns as they whisper stories to any who will look closely. I am in many ways, a canvas and I truly enjoy every moment of it. My style, my flavour, allows me to bring a secondary role of leadership and change to designs, ways of thinking and so much more. It is often the smallest things that count most. 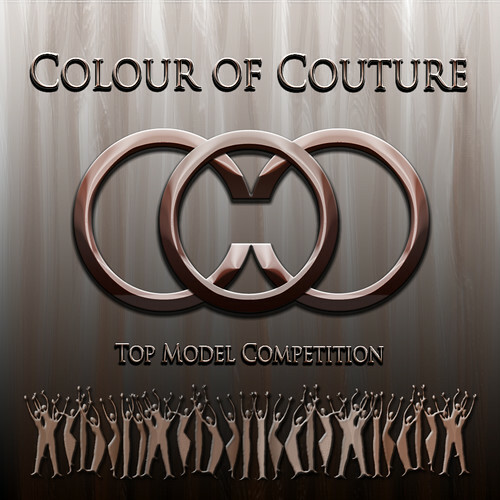 How will you promote the Miss Colour of Couture competition as a finalist? How will you promote the title of Miss CoC should you win? I will do my best to promote it in the best light possible and to listen to those within this organization on the very best ways to accomplish this. Of course, I will promote this competition on my blog, in my profile, in my flickr account and in many ways but I believe that this truly goes far beyond being merely about me or any of us and should I win, I will need to take into account how this organization can be best represented, how the members feel it could be best promoted and ensure I bring only the most positive of lights to shine upon it in a manner that will promote women of colour and all future competitions for this title. When the year is over, this title and organization will remain, I won’t forget that. What sort of impression would you like people to have of you if win the title? What impression would you like to leave with them if you do not win? 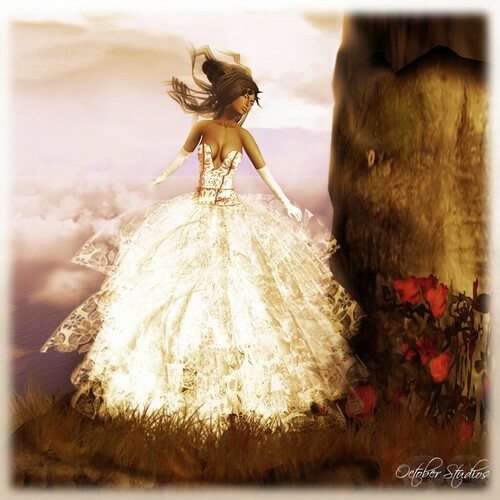 What do you envision your activity in SL to be a year from now? What goals and ambitions do you have? It is my hope that it will be just like today, full of wonder and limitless opportunity. I’m like a child in a candy store. I hope that I’ll be surrounded by just as many amazing people, continuing to design, to create and to model. I hope I’ll be continuing to work with amazing creative designers and that I’ll meet so many more. Second Life is full of inspiration and I feel blessed to be in it. I’d love to be a top model, but I truly do already feel like one and that is because of each and every person I have met and worked with thus far. Each day is a wonder to me and I cannot wait to see what comes next. 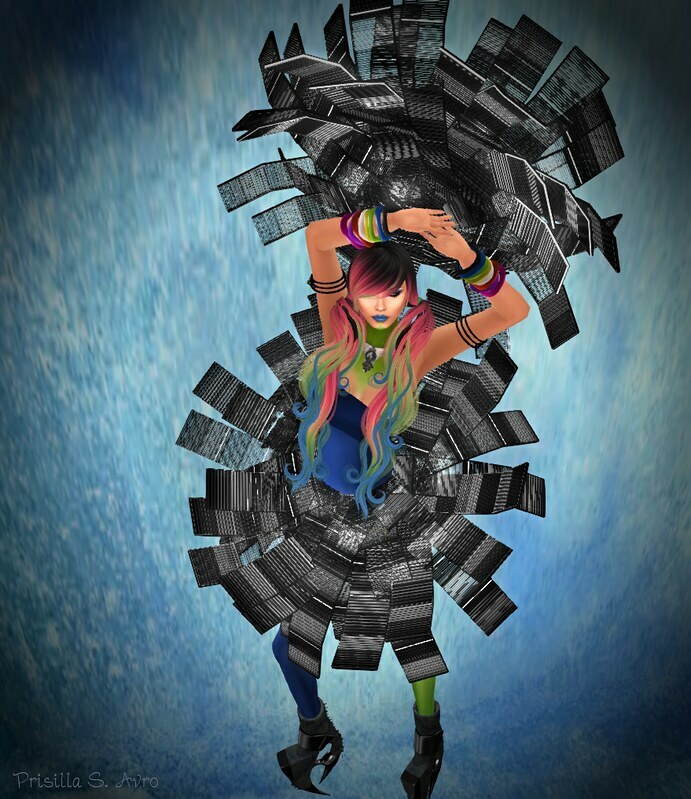 Briefly summarize your professional career as a model in SL? 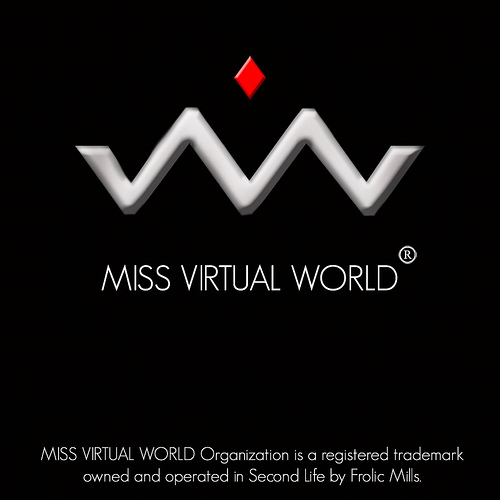 I have really just started, I hope to graduate Miss Virtual World Modeling Academy next weekend, in April. I am a print model for House Of Rfyre. Do you have any additional comments you would wish to share? I would simply like to thank you for this opportunity and my teachers at MVW and everyone who has supported me or in some way, helped me with a word or wisdom. Please, keep it coming. I can’t wait until tommorrow!